Playing cards generally have a long lifespan. But when you're ready to discard a used deck for some fresh, crisp cards, you may want to hang onto the old ones. 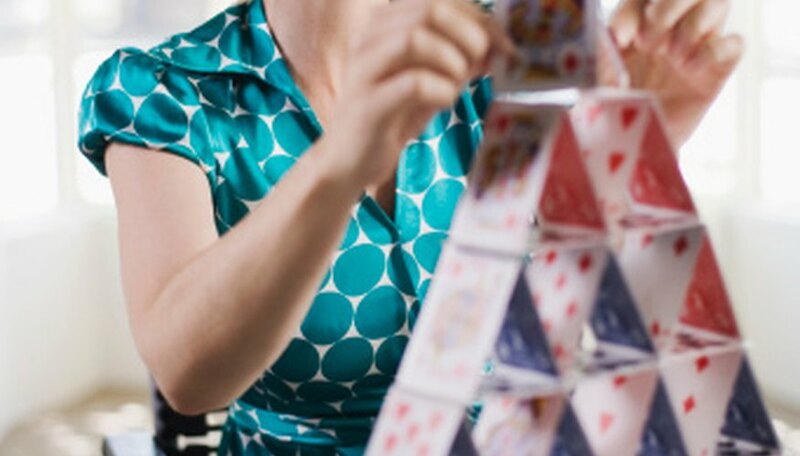 A variety of fun things can be made with a deck of playing cards. Instead of throwing cards out, use them to spruce up a variety of items. Playing cards serve as a clever decoration for storage boxes, picture frames, notebooks and desktops. Any craft that requires a lightweight card or paper can be adorned with playing cards. People who are slightly more ambitious may use the playing cards to make a fashionable accessory. A creative top hat can be made using playing cards and a stapler. The hat makes for a fun addition at parties or a friendly game of poker with your friends. Additionally, with some playing cards, scissors and tape, one can create a usable wallet. The cards can be arranged to form a foldable wallet with space for dollar bills. Extra cards can be affixed to the wallet to form pockets for credit cards and a driver's license. Recycle This: How Can I Reuse or Recycle Bashed Up Playing Cards?